Last year, Intel scrapped its Project Alloy merged reality headset after it didn't find enough interest in the reference device. The company took a breather, recuperated and is now diving into the world of augmented reality. Bloomberg previously reported the company is looking to launch a pair of AR smartglasses by the end of the year. Internally, the glasses are referred to as "Superlite", due to Intel's goal of making it lighter than 50g, and would be a part of a new spinoff company that may be called Vaunt. The Superlite glasses are being made by Quanta Computer, according to the report, who is no stranger to wearables (it helps make the Apple Watch) and augmented reality. Thanks to a new hands-on from The Verge, we know a good amount about how Intel's AR glasses work. It displays contextual information into the wearer's field of view via a laser-based projector. That projector broadcasts a monochrome image that's around 400 x 150 pixels. There's no camera, there's no microphone, there's no speaker or gesture area or button to push. However, future models of the glasses may have a microphone to interact with a voice assistant (Alexa, perhaps?). Battery life is about 18 hours and when you wear them you'll find red icons and text in the bottom right of your vision. Intel has pulled off a neat trick here. The text and icons are persistent, telling you who's texting, walking directions, and other things like that. But due to how our eyes work, the displayed information is presented in such a way that your eyes will naturally ignore them when you're not directly looking at them. So even though the information is ever-present, you won't notice unless you're literally glancing at it. For the most part, the icons and notifications remain still, which makes it easier for your vision to ignore them. The information placement puts it in your peripheral vision when you're looking straight. It's lack of movement makes it metaphorically invisible, until you get a new notification. Because humans are good at noticing movement in peripheral vision, that's when you'll be able to tell when something new is happening. The glasses will also pair with your iPhone or Android, and Intel's AI will take accelerometer and compass data from the glasses, pair them with the power of your smartphone to give you want you want. It's not clear how well this will all work out, but Intel is hoping this will allow things like pulling up a Yelp review when you look at a restaurant or giving you directions to your gate when you're at the airport. The smartglasses, which earned the Superlite code name because they're meant to be under 50g, are aimed at consumers. Intel is hoping to find a partner with a strong retail presence that can help get these things into stores, and it says there'll be multiple styles so that consumers can get their fashion on, but it also has contingency plans in the offing in case things don't go down as well as it hopes. 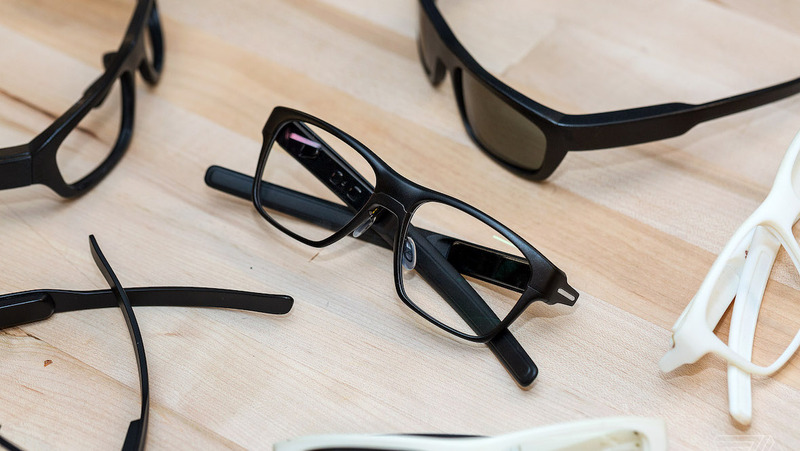 The company is planning to provide technology to other manufacturers of AR glasses should the consumer-facing Superlite glasses fail to take off. Intel is also willing to use the glasses as an example of what's possible, even if consumers don't buy in. It's not surprise the company has backup plans in mind. Intel, after all, has struggled to gain some space in the wearable market. Similar to Project Alloy, it killed its wearable division late last year. However, those moves were in an effort to concentrate on augmented reality. It acquired Recon Instruments way back in 2015, only to shut them down last year. Bloomberg says team members from Recon have been moved toward the Superlite project.